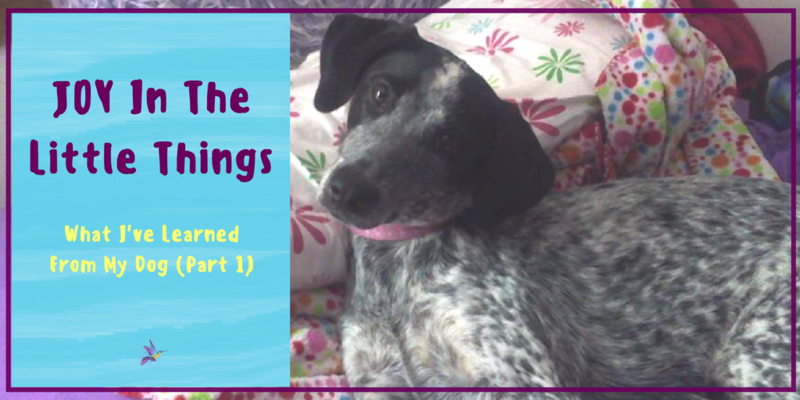 Recently, I was sitting in my chair blogging when one of my dogs, Bella, brought me her bed. Bella's bed is her version of a security blanket. She never actually sleeps on it, but she carries it around constantly. It is old, tattered, and always looks disgusting (even if it's just been washed). But Bella doesn't know that. She thinks everyone should be very impressed. If someone comes to visit, as soon as they walk through the door she get's her bed and carries it to the visitor. She expects them to acknowledge it, saying something like "Bella, that's a nice bed". Then she will continue to prance and wag her tail, still clutching the ragged bed in her mouth. She does this every morning when she wakes up, too. She brings me her bed and expects the same reaction, even though we've done this an uncountable amount of times. But she is still so proud! Seeing Bella take pride in such a simple possession got me thinking: why don't we find more joy in the things in our lives? We are blessed with so many things. God gives out gifts to all of his children, but they look different for each person. Whether something big like a spouse or a job, or something small, like the ability to bake yummy treats or write well, we should find joy in all that we have. Bella's bed does not impress anyone else, but she loves it and she tries to share that joy with everyone she meets. This doesn't mean that we have to sit the things we are thankful for in other people's laps (I'll let Bella handle that with her bed), but we should be proud of what we've been blessed with- content with it, and joyful that God has chosen to give to us. I think sometimes we hide away the things we enjoy because we are afraid that people won't understand. I felt pressured to write dark, depressing works in college because of two particular students who's reviews of my writing really cut deep. Some things that they critiqued about my writing were spot-on and very helpful, but some of their comments made me feel that I was not talented if I wrote Christian fiction, or if what I wrote was positive. During this time, I decided that I had to write darker material to be any good. But that wasn't what I enjoyed, it wasn't what God had gifted me in (at least, not as much so), and it wasn't making a difference in people's lives. I was proud of my inspirational and encouraging writing. I was proud of being able to articulate something that would challenge others, as well as myself, in the Lord. I was proud of writing happy things, because the world sees and reads enough depressing material. They don't need anymore. Those students may have seen my writing as tattered or unimpressive (as us humans see Bella's bed), but I have realized within the past year or two that I am proud of my writing and I love it. God has blessed me with the gift of writing and I am thankful. I can definitely improve (and we should always strive to improve), but the point is, I have learned to find joy in a gift that God has given me, a gift that I can use to glorify him. And I am no longer afraid to show it to others- to take it around the room with my metaphorical tail wagging. And I think that that is a great place to be. So take a lesson from my crazy, obnoxious, adorable, and hyper-active dog: Be content with what you have. Be proud of what you have. Be thankful for what you have. Bella may not be using her bed for God's glory (since she doesn't really know who God is, haha), but I can use what God has given me, the things I find joy in, and the gifts I have been blessed with, to please God- the giver of all good things. Other people may see it as ugly or insignificant, but if it is from God, then it is the exact opposite! What have you been hiding away because others may judge it's appearance? How can you start to use it for God's glory? Awww... I miss our dog.... but we're getting to pick up our new puppy on Valentines day!!! Found ya from Elizabeth's (Oak and Oats) blog! Aww, I'm sorry about you dog, but a new puppy is always exciting! Do you know what kind you want? Thank you so much for stopping by! If you enjoyed my post, I'm on Bloglovin or you can sign up by email too. I don't have a dog :( And my parents never let me have one growing up. I've been thinking about getting one soon though! Awww! That is so sad! I cannot imagine not growing up with dogs! The last time I didn't have a pet was when I was 3! Do some research when you do get a dog so that you can match the breed to your lifestyle. For example, if you are a avid runner, don't get a bull-dog, and if you are a couch potato, don't get an Australian Shepard. lol. This is so sweet! It truly is amazing what simple reminders we can get from our pets/children etc. Learning to be content and happy with what we've been given is a great lesson to learn. Great post! I think it's hard to own what makes us happy sometimes. Once we realize that we don't need to be embarrassed by our passions and once we stop caring what other people think then we can truly learn to love ourselves and not be ashamed of who we are and what we love. Rebekah, it really is tough. But we've got to own up to it. It makes life so much more full! So beautiful! 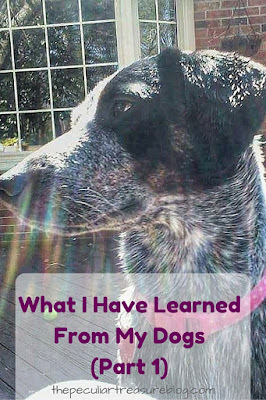 Have you ever seen that piece where the 5-year-old explains that we are put on Earth to learn how to be good people and dogs live shorter lives because they learn so much faster than humans? I love reading that story again and again. They really are wonderful creatures. Nicole, I have not seen that, but that is too cute! I've never thought of it that way before. haha. Aww, Bella is so cute! Dogs are such amazing animals, loyal, friendly and playful. They really do make you think about things in a different way. Love this! I learn so much from my pup too. They're such great companions! We can certainly learn a lot from our furry friends! We are thinking about getting a puppy I love this!